Good Morning Britain host Susanna Reid has showed off the results of her incredible weight loss. The presenter, 48, looked toned in a sheer maroon dress on today's show (April 3rd), having dropped a whopping two stone by avoiding booze and dieting. Susanna started eating healthily last summer, when her GP put her at the higher end of the Body Mass Index scale. But instead of putting herself through a gruelling gym routine, the mum-of-three decided instead to make a few simple changes to the food she eats. Speaking to the Daily Express, Susanna said she had cut out snacking, reduced carbs and given up alcohol. She told the paper: "I wanted to shift some weight and as part of that I gave up drink. I've stopped snacking between meals and I am eating more sensibly too. "I wanted to do it for me and I'm glad I did... I do feel much happier and healthier." On going teetotal, Susanna said she felt "clearer, sharper" and no longer in a "constant state of jet lag". In her recent appearance on Lorraine, Susanna blamed her early starts on GMB for her weight gain. I wanted to do it for me and I'm glad I did... I do feel much happier and healthier. Opening up about her lifestyle changes, she said: "I went to a doctor because I just wanted to ask him about skin problems and he said I recommend two things. "One is you stop drinking or cut down on drinking and one is you lose some weight because you are at the top end of your BMI." She continued: "It can creep up without you noticing, I cut out snacking, I found waking up so early in the morning and you're in energy deficit and all your body can think is, 'have toast, have biscuits' and you can pile it on really." She's not being too strict with herself as she admitted enjoying a cheeky margarita when she hosted GMB with co-star Piers Morgan from the Oscars in Los Angeles, though it did take her body "two days" to get over it. 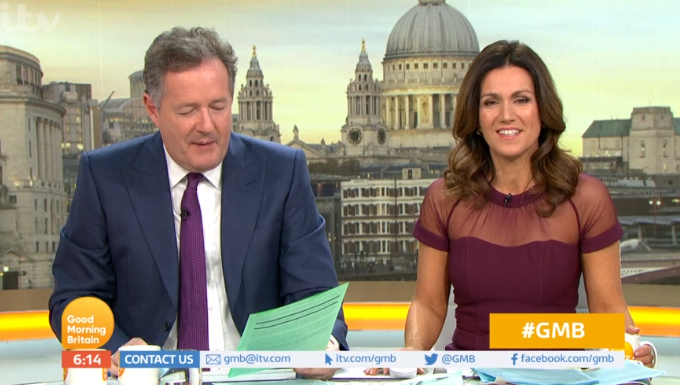 Elsewhere on today's GMB, Piers brought his own weight into the spotlight by joking that he now "identifies as skinny". He launched into a speech about identifying as "trans-slender" but was mocked by producers who interrupted him by playing comedy music. What do you think of Susanna's transformation? Leave us a comment on our Facebook page @EntertainmentDailyFix and let us know.